01182013_Becherer_IraqDawn007: Iraq Rebuilding: Iraq: Global News Portfolio: New Orleans based Photojournalist covering the Deep South and beyond. 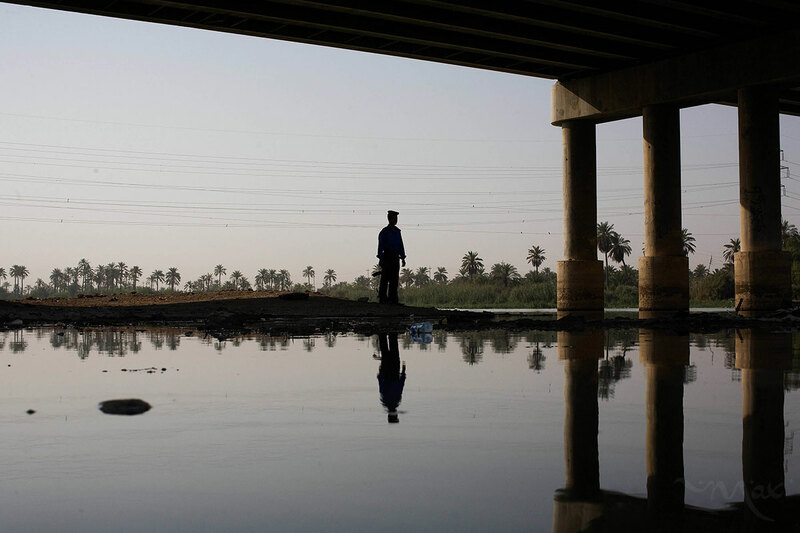 Iraqi Policeman Mohammad Nassir stands guard under one of the main bridges leading into the city of Nasiriyah over the Euphrates River. The bridges were key to attacking American forces in order to get their heavy tanks and armor over the river. Nassir was a child when the Americans first came in but he remembers seeing the Americans attacking several of the houses near the bridge on March 23, 2003. He now works as an Iraq Policeman guarding the bridge and watching for suicide bombers entering the city.